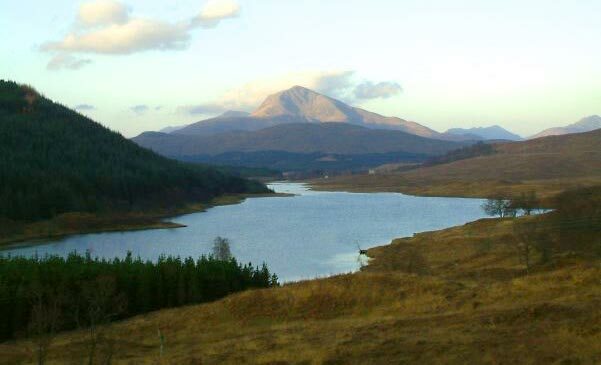 Gairich is located between Glen Kingie and Loch Quoich. It has moderate to steep slopes rising to crags below the summit ridge which runs SW to NE, with two peaks, Gairich and Gairich Beag (730m). From the summit ridge three ridges arise, NNW turning N to Meall a' Coire Leith (437m), NNE and finally E to Druim na Geid Salaich. The normal ascent route is via the E ridge on easy slopes leading to a steep climb through rocky outcrops to the summit. 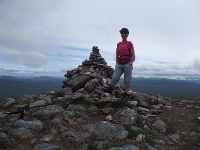 An alternative ascent can be made via the W slopes of Gairich Beag were a stalkers path leads to the summit. The east ridge of Gairich. 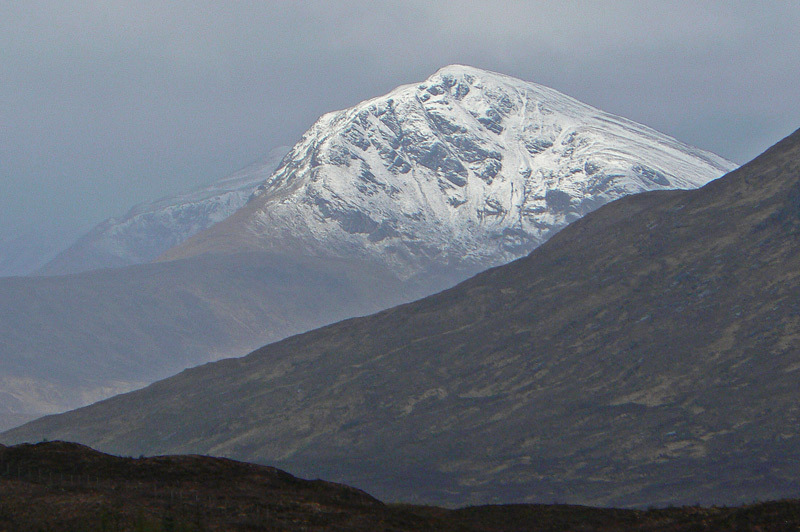 Gairch seen from the Kinloch Hourn Road. Gairich from the A87; 8th May 2009. 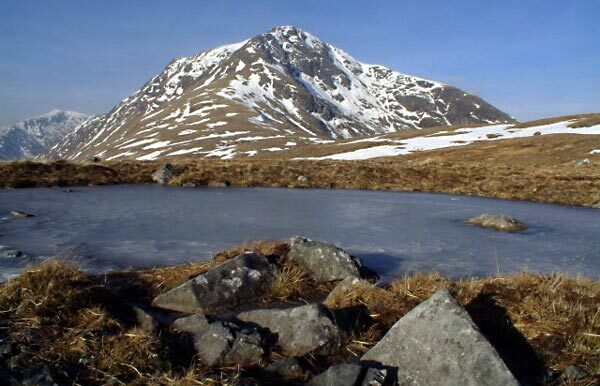 The summary information of one or more ascent routes that include Gairich. 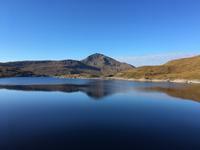 1 1165 m 20.91 km 6.5 hrs Gairich Moderate route with some scrambling close to summit. 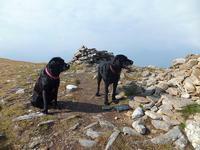 Maura (on the left) and the Wee Black Dug at the summit of Gairich. September 2014. On top of Gairich, another good day in the hills. Post a few words about Gairich or read what others have had to say. Showing the most recent 5 of 8 comments. Would you like to view all 8? Climbed 15/03/12, Path is indeed very boggy- some sections as deep as my trekking pole! Other than that a nice walk with a cpl of scrambly bits near top. Nothing to worry about thou. 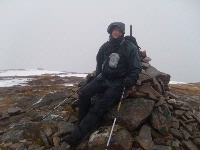 climbed 11/9/06 - slight exaggeration on path, wore gaiters expecting worst but nothing remarkable, encountered a lot worse in 240+ munros. good path along ridge to base final steep 320 m climb to summit and excellent path scrambles up front. Our party of 6 took 6hrs enjoying views etc - much more enjoyable than expected and good character. Return via stony shore for some variety if ground really wet. My son Ellis and I climbed this hill on January 3rd 2006 when most of the ground underfoot was frozen solid. Judging by the comments before it seems like we did the right thing! The steep zig zag path to the top avoids most problems and the views were stunning. For the full wetness effect, try climbing this hill on the fourth day of heavy rain, and on a day when the west of Scotland flooded. Be aware though, that in very wet weather the unnamed burn feeding into Glen Kingie at NN066996 will be difficult to cross. A good guide is the outflow from Lochan nan Fhigheadair - if you have to wade this on the way out, it will be difficult to cross the burn without a waist deep wade. Otherwise a good little hill - celebrate the moisture!